It's coming close to the end of March and all I can say thank goodness! While this month wasn't all that terrible, it was riddled with many horrid snow days and a severe lack of motivation. 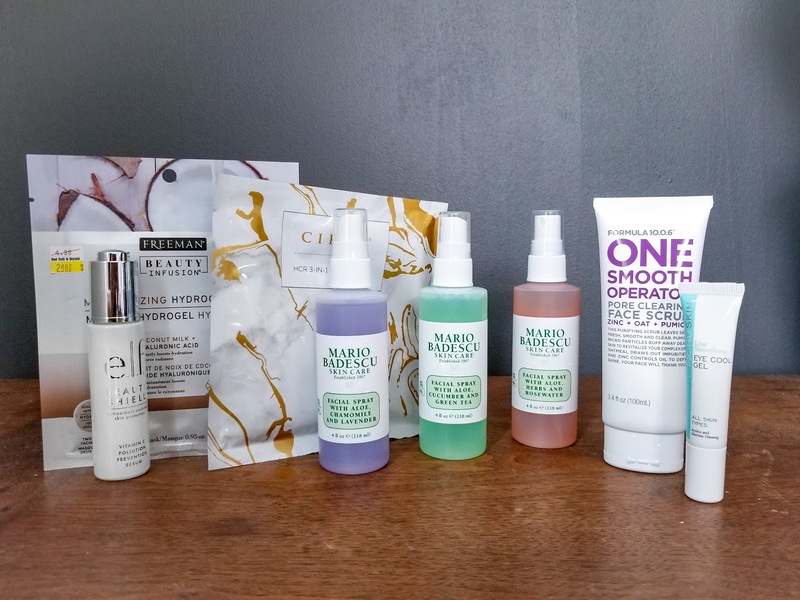 However, there was one good thing that came out of March; my updated skincare routine. I received two gift cards to Ulta for Christmas and, finally finding a day to spend them, went on a little spree to find new gems to add to my collection. At first, my shopping cart was filled with all types of drugstore makeup brands that I've heard great reviews for. Then, as if hit with a wave of intelligence, realized I could get that any time I like. After all, there is no shortage of drugstores. Therefore, I went on a hunt for different skincare products to give myself a little glow and health. For me, these cold months mean I'm tackling dry skin that flakes within minutes. I use heavy creams every day (my favorite right now is Dove Intensive Creme) and try my best to exfoliate when I can. The problem is that most exfoliants are for people who have oily skin (which is clearly not my problem). After doing some research, reading countless reviews, and going back and forth on several products, I finally found my holy grail of skincare. These products are probably going to be on my shelf until something better comes along. They are also great for anyone who has sensitive skin and still work great for people with the oil issue. I've seen this brand everywhere for years. I know I'm late to the party when it comes to their fantastic line of face mists, but I finally made it here! I purchased the set of three sprays they have and use them morning, afternoon, and night. Each one has different ingredients such as aloe, chamomile, green tea, and lavender. They are made to go over your body, hair, and face whenever you need that extra boost. I love these as aromatherapy and hydration products. The smell always puts me in a tranquil space and, while it might be a placebo effect, I do believe my skin has been more dewy and bright recently. If you had to only pick one out of the three, I would go for the aloe, herbs, and rosewater bottle. This one smells fantastic and leaves your skin feeling hydrated. Like I said before, my skin is crazy dry. While most people exfoliate to get rid of oil and clogged pores, I use these products to help get rid of all the dead skin cells lying around on my face. I'm picky when it comes to these products as well. Since my skin is sensitive, I have to make sure it doesn't break me out and doesn't leave my face feeling like sandpaper. I also love an exfoliant that FEELS like it is working. If you are not taking off a layer of my flesh, you are not in competition with my skincare routine. In comes One Smooth Operator. This pore clearing face scrub has that perfect texture of beads we all crave in our exfoliators. Made with zinc, oat, and pumice, this product does a fantastic job of cleaning your face without making it feel bone dry afterward. It also smells fantastic, something that usually means it will break your skin out (but I have had no issues so far). I did see on the Ulta website that the company (Formula 10.0.6) has an entire skincare line that is relatively inexpensive. Elf products have always been a hit or miss for me. While their makeup usually isn't my favorite, I do always gravitate towards their skincare line. When I saw this product, I was intrigued by the sleek look and the fantastic reviews it had acquired. I was looking for a vitamin c serum and, after countless searches, felt like this one was worthy of trying out. I've only used it a few times, but I'm already hooked. I would say this is one of the best serums you could get for a low price. On the bottle, it says it is an antioxidant-enriched skin protection serum, but it does so much more than that. After the first use, I saw a drastic difference in my skin. Not only did it help brighten my complexion, but it also gave me that dewy glass look that we all crave. With its easy to use applicator, you only need a few drops, and you massage it over your face. Out of all of the products I tried this month, Elf Beauty Shield was by far my favorite. I actually received this eye gel in a Glossybox a few months back, and kind of forgot about it. While it doesn't do much for fine line and wrinkles, I feel like it should still be included in everyone's skincare routine. I still have a nighttime cream, but I love using this product for the mornings. It goes on your eyes with a cooling sensation and immediately wakes up the skin. Again, don't buy this if you are trying to minimize wrinkles. However, if you are like me and suffer from puffiness or dark circles in the morning, this is the gel for you. I now use it even when I don't have these issues because it gives my face a wake-up call that I didn't know it needed. 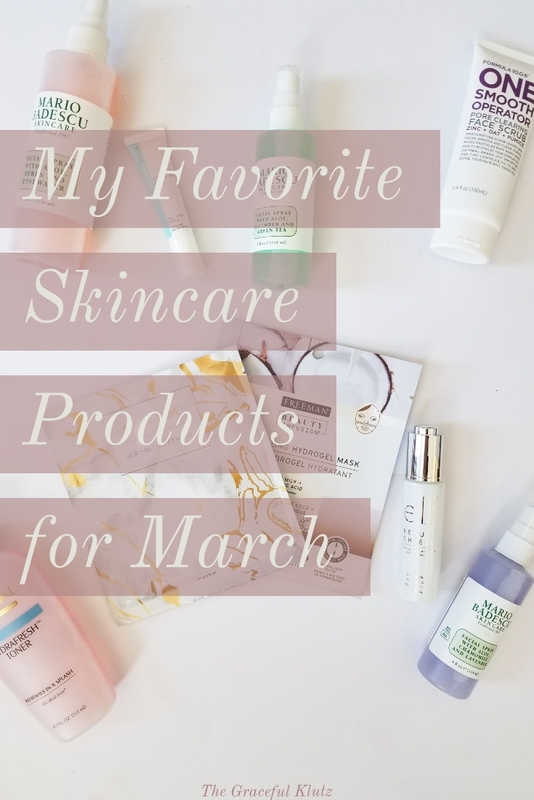 I believe I talked about the Cirem face mask in a past article, but I still find it relevant for my March favorites. This mask helps revitalize, refresh, and restore in just 15-30 minutes. Do you know the joy you get from the thick face masks? The ones that are just oozing with the product? Maybe I'm weird, but I always feel like I'm getting more when it feels this way. Not only does it feel heavy, but it also works overtime to help hydrate and refresh your face. The mask perfectly goes over your face and leaves it radiant afterward. I also was highly ecstatic about the Freeman Beauty Infusion Mask. This one is a product I received during Christmas and, after trying it, will definitely be purchasing more. Similar to the Cirem mask, this sheet gives you hydration and radiance without feeling sticky afterward. It's perfect for anyone who is trying to get that glow from within. What were your favorite skincare products this month? Anything new that you are obsessed with? Or are you still sticking to those tried and true products? Let me know in the comments below!